To highlight the significance of this jersey, the President of the Baseball Hall of Fame, Jeff Idelson has recently stated he "would love to see this jersey in Cooperstown." In addition, the National 9/11 Memorial Museum has contacted us so that we may inform our bidders they will proudly accept this jersey on loan or as a permanent donation. Goldin Auctions will be proud to help facilitate this request if desired by winning bidder. September 11, 2001 will be a date that no one in this lifetime who was old enough to remember will ever forget. All aspects of life were seemingly put on hold as the grieving and stunned nation came to grips with the terrible and tragic events of that day. In the sports world, especially for all of the major professional sports leagues, the questions lingered as to what was going to happen – do they cancel the seasons (for those sports that had started), do they start up (for those sports that had not started yet), do they postpone or do they carry on. The NFL cancelled all of the games on September 16th and 17th and ultimately moved the Super Bowl back one week to make sure all of the regular season and playoff games were played. The NHL was still in its preseason and cancelled 23 preseason games, while the NBA had not started at all (but did cancel their scheduled international preseason games). Baseball was already in its final weeks of the season and Commissioner Bud Selig decided the games would resume on Monday, September 17th. The New York Mets traveled to Pittsburgh for a three-game set, while the New York Yankees resumed their schedule in Chicago against the White Sox on September 18th. As baseball resumed in all its cities, eventually, the time would come for New York to play host. That day came on Friday, September 21st as the National League East Division leading and hated rivals, Atlanta Braves came to town to face the Mets as the Yankees were still on the road, this time in Baltimore. This, of course, was not just any other game. Emotions were running high as 41,235 fans packed Shea Stadium as the city of New York would host its first major sporting event while the nation turned its eyes on the Big Apple. There were tributes to the victims of World Trade Center collapse and then Mayor Rudolph Giuliani appearing before the crowd with his “FDNY” hat and receiving chants of “Rudy, Rudy!”. Marc Anthony sang the national anthem, Diana Ross belted out “God Bless America” and Liza Minnelli would sing stirring rendition of “New York, New York”- not a dry eye in the stadium. The game almost seemed an afterthought until recently elected Hall of Famer Mike Piazza, who hit 427 career home runs, hit his most famous and arguably most important home run of his career on that memorable night in Flushing, Queens. Trailing 2-1 entering the bottom of the eighth inning after Atlanta had just taken the lead, Piazza, facing an 0-1 count, hit a towering blast off of Atlanta Braves relief pitcher Steve Karsay that seemingly landed somewhere near LaGuardia Airport in the bottom of the eighth inning, which erased the 2-1 deficit and gave the Mets a 3-2 lead. A lead they would not relinquish. The crowd responded with cheers, some tears and then... “USA! USA! USA!” For at least a few moments, this moment allowed the capacity Shea Stadium crowd a brief opportunity to rejoice in the shadow the events that took place 10 short days prior. All told, there were 5,791 home runs hit at Shea Stadium when it closed in 2008, but none was more important or poignant in that stadium’s 44-year history. "It was almost like a blur to me, it was almost like a dream, sort of surreal," Piazza said at the time. "I'm just so happy I gave the people something to cheer. There was a lot of emotion. It was just a surreal sort of energy out there. I'm just so proud to be a part of it tonight." 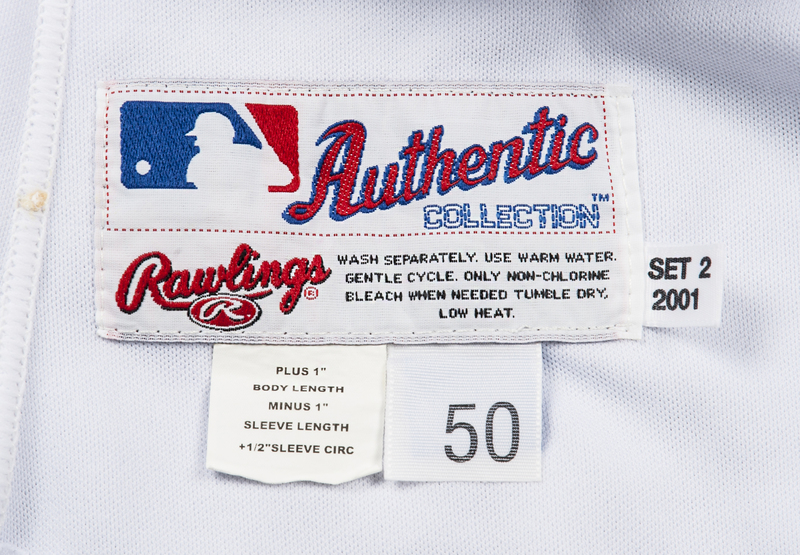 Piazza wore this Rawlings size 50 New York Mets white alternate jersey during this game and features “Mets” sewn on in blue, orange and black tackle twill script and Piazza’s “31” is sewn on the left center chest in the same color pattern. Royal blue piping runs along the collar, buttons and sleeves and a Mets logo patch is sewn on the left sleeve. 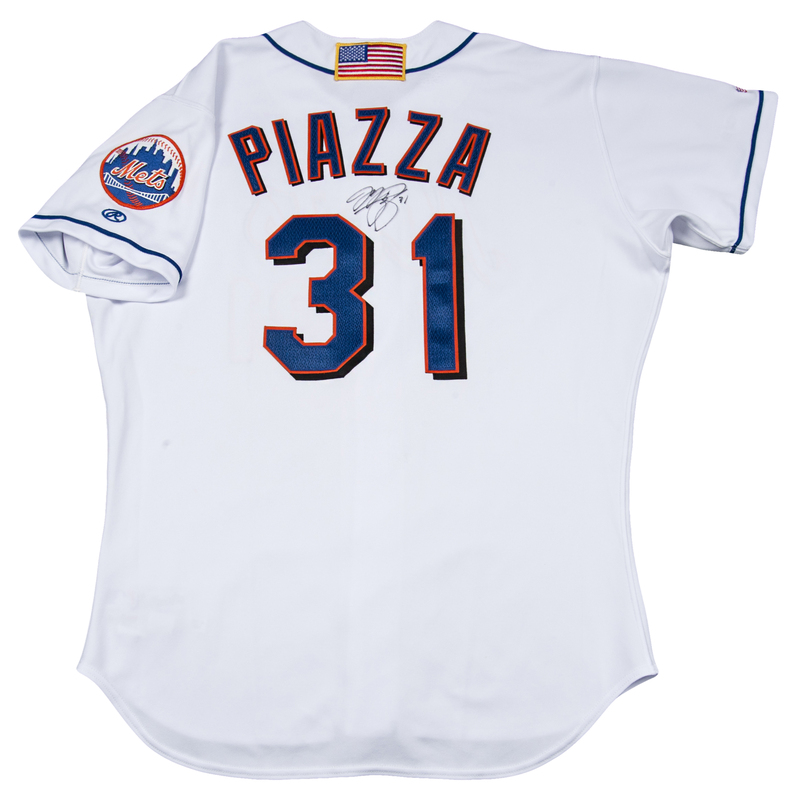 Piazza’s name and number are also sewn on the back. Piazza signed his name in black marker on the back of the jersey between his name and number and inscribed “31”. Two additional items were added to the Mets’ jerseys after the 9-11 attacks, an American Flag patch that was sewn on the base of the neck and an inscription sewn on in white on the right sleeve surrounded by waving American flags that read “9-11-01”. 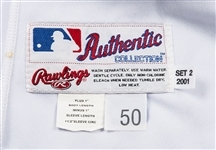 This knit jersey has all of the Rawlings manufacturer’s tags sewn on the inside front tail and customization tags that include “PLUS 1” BODY LENGTH MINUS 1” SLEEVE LENGTH +1/2” SLEEVE CIRC” and “SET 2 2001”. 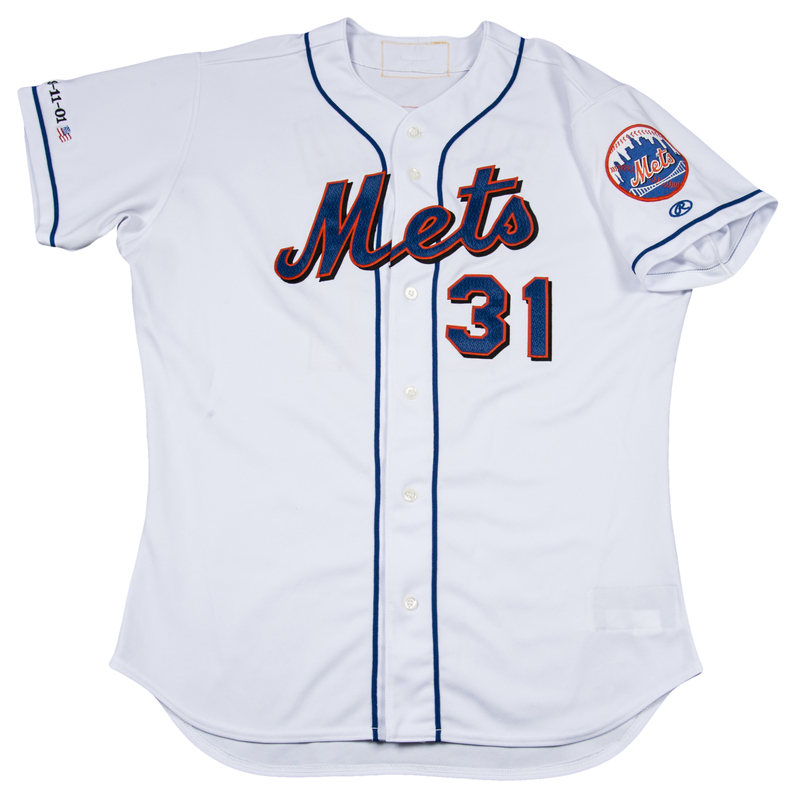 Also included with this historic jersey is a blue plate that was displayed with this jersey at Citi Field in the Mets Museum that reads "A MOMENTARY RELIEF It was the first regular-season professional sporting event in New York City after the attacks of 9-11, and in this jersey, Mike Piazza hit the game-winning blast against the Atlanta Braves on September 21, 2001 lifting the spirits of a heartbroken city, if only for a brief moment." 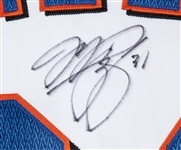 This item comes with a letter from the New York Mets and has a photo-match to the exact game with a MeiGray photo match LOA. Goldin Auctions is proud to offer this piece of New York baseball history. Without a doubt the most important home run in Mets history, and for the United States and the world, a great memory that transcended sports and to many started the healing process to the City of New York and the country. The 9/11 Memorial Museum at the World Trade Center in New York City welcomes millions of visitors each year. Through this jersey, generations will connect with that special moment when Piazza's home-run hit helped a city and the nation find hope and a sense of normalcy in the days after the 2001 attacks. A donation of this jersey would be proudly accepted and considered a charitable donation for tax purposes.